All my yarn is 100% acrylic. I use it because it's soft and none itchy. It's machine washable as well. Measure the circumference of your head. If you don't have a tape measure, you can use string and measure that with a ruler. I account for stretching so please order your actual head measurement unless you'd like an extra baggy beanie then order a couple of sizes bigger. 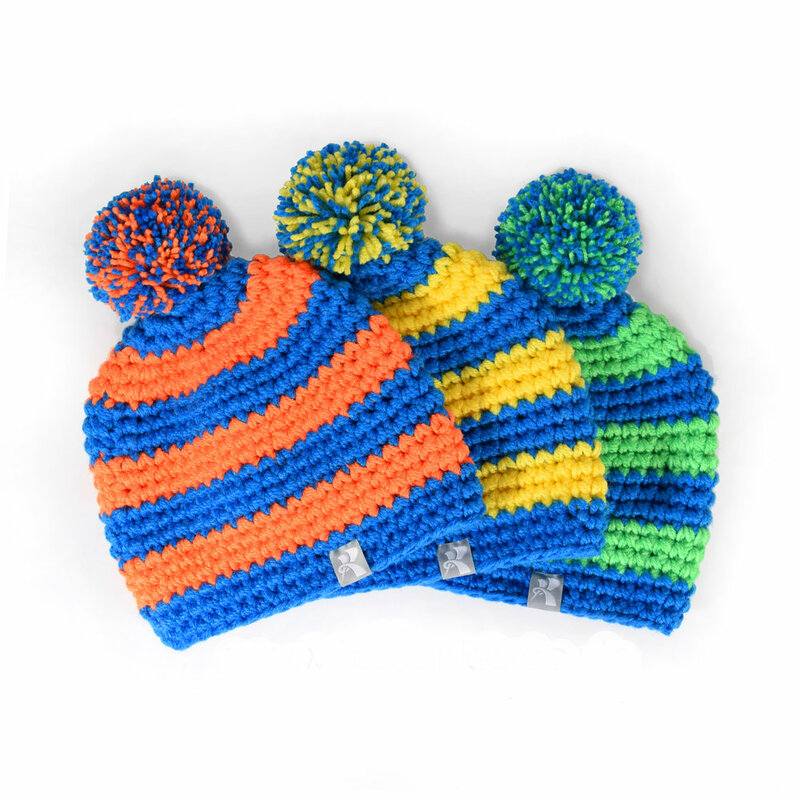 Important to know: Your beanie will be custom made to your head measurement so if it stretches to fit someone with a much bigger head, it may not fit you as well as it did before. I've provided some popular design ideas with each beanie style but if you'd like to design a beanie with your own pattern from scratch, here's what you need to know: Classic Fit Beanies are made up of 22 rows (approx 1cm each), Mid Floppy Beanies are 25 rows and Floppy Beanies are 28 rows. Provide a pattern starting from Row 1 at the top to Row 22 (25 or 28) at the rim closest to your face. The first 2 rows are not at all visible under a pompom so if you'd like even looking colour bands then consider making that top colour a couple of extra rows thicker than the others. My standard headband is 12 rows wide which works out to be approx10cm. You can specify whether you'd like yours narrower or wider. An example pattern: Green x 4, Orange x 3, Yellow x 3, Blue x 3, Red x 3, White x 3, Green x 3 until you reach the 22, 25 or 28 rows. 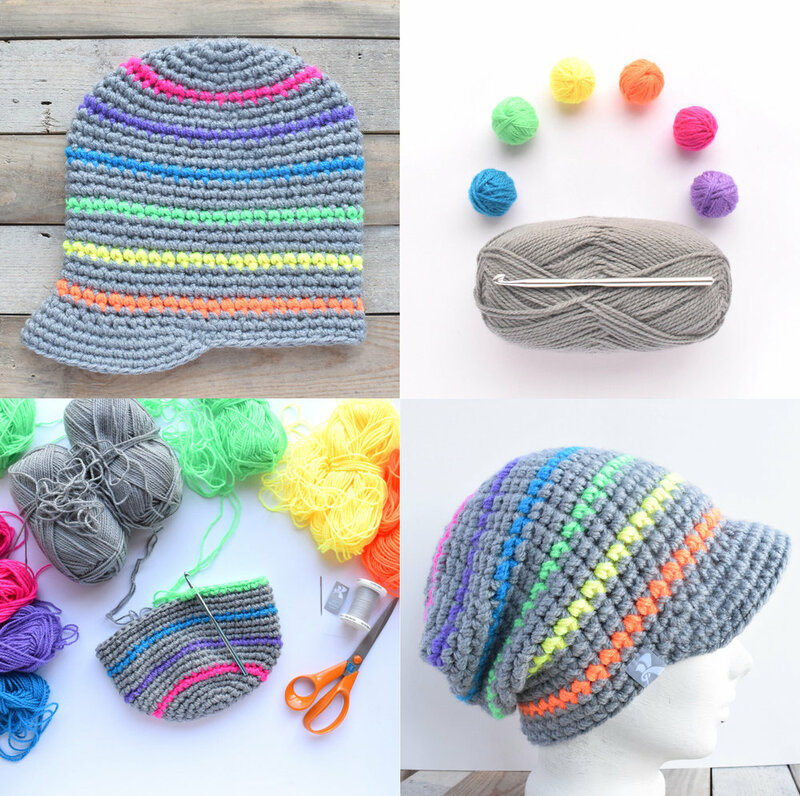 I included specific pattern instructions for each of the beanie styles, so if you're unsure, simply select the style you like and have a look at the photos. My standard pompom is about 8cm in diameter. You can ask for a smaller or bigger one, 12cm is the largest. It can either be a solid colour or a mixture of 2 or more colours. Please specify which colour/s you'd like in your pompom when you submit your design instructions. 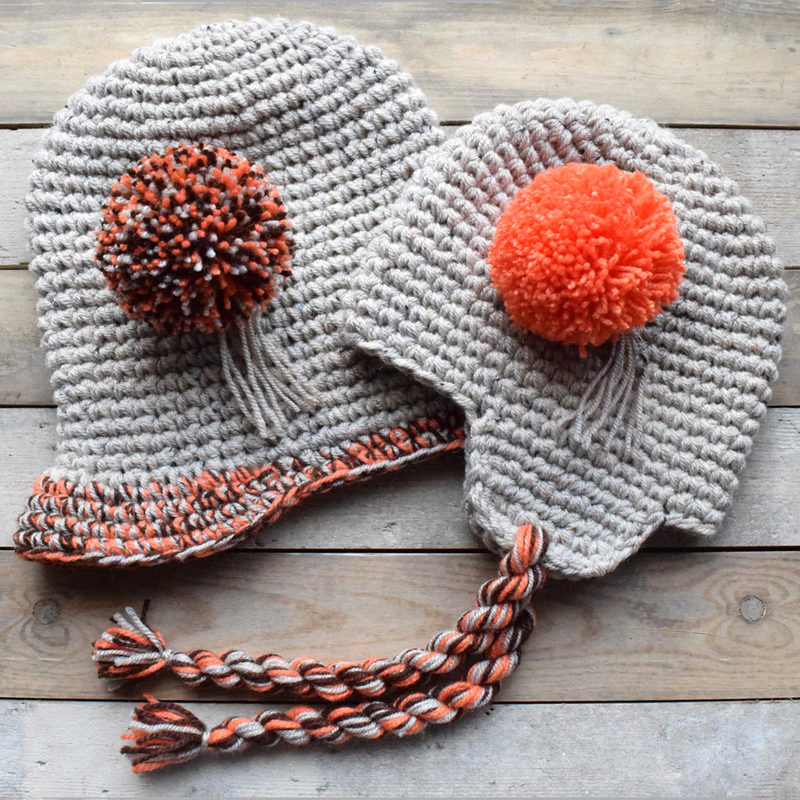 My standard tassels are about 8-9cm depending on the size of the beanie. If you'd like them a bit longer or shorter, just let me know. They can also be a solid colour , mixed or 2 colours twisted together to create an alternating effect. I can also put little pompoms on the ends, however I charge £4 extra for this. If you prefer braided tassel please don't hesitate to ask. I will be updating the images to include those versions soon. There are a few options for crochet lettering. My standard lettering in the first image is 5 rows tall by 3 stitches wide (approx. 5cm x 3cm) I can fit around 8-11 of these letters around the beanie depending on the letters involved and the size of the beanie. The 2nd option are letters that are 7 rows tall and 4 stitches wide, the 3rd option are bold letters which are 8 rows tall by 6 stitches wide so quite big. I can only fit about 6-8 of these around a beanie, again depending of letters and size of the beanie. If you are designing a beanie with lettering be sure and position them lower down on the hat, anywhere below row 12 is good. The best part about these letters is that they're FREE! Fleece will add that extra bit of warmth and luxury to your beanie. I offer a 10cm wide fleece band and below shows the circumference area that covers. If you would like to see a mock image of your beanie before placing an order, please fill out the form below and I will be in touch with you as soon as I can. I look forward to hearing from you!